Firefighters in Rockdale County are still watching a fire at BioLab that started more than 24-hours ago. The fire occurred at a facility owned by BioLab, which makes chemicals to purify swimming pools. 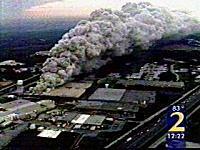 A huge plume of thick black smoke was visible for miles in the area. The smoke contains chlorine and can irritate eyes and skin. Law enforcement authorities ordered residents to leave the area or stay in their homes and close windows and turn off air conditioners as a precaution. Local officials are asking some residents within a 5-mile radius of a burning chemical plant to leave their homes, according to the Conyers Police Department in Georgia. A fierce fire is still burning at the plant, sending up a huge plume of black smoke thats forced authorities to close parts of nearby Interstate 20. The chemical burning is a chlorine product.